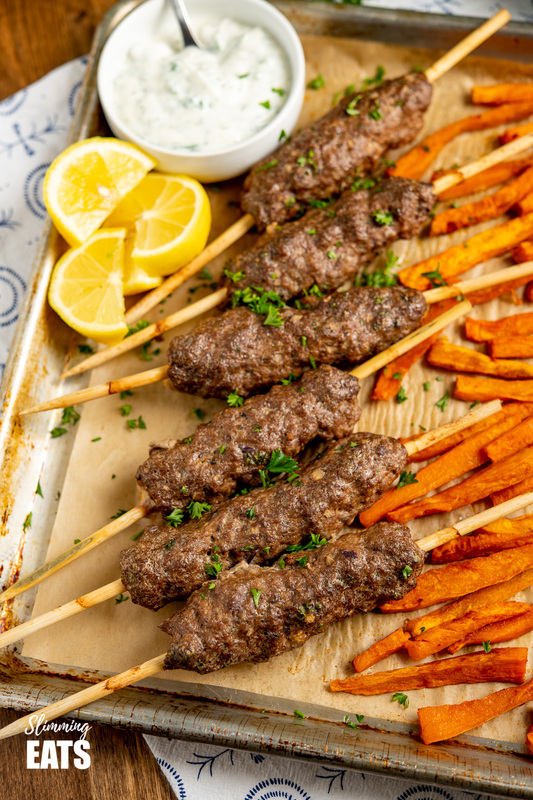 Yummy Beef Kofta Tray Bake – authentic Kofta kebabs with sweet potato fries and delicious roasted vegetables all finished off with a garlic yoghurt sauce. Tray bakes are definitely my thing at the moment. 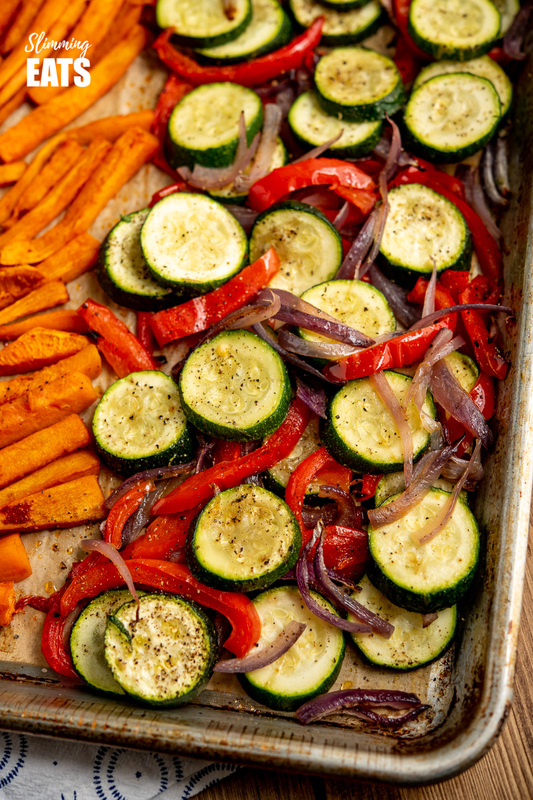 I LOVE that I can add some ingredients all to one tray, pop it in the oven and in no time at all have dinner on the table. 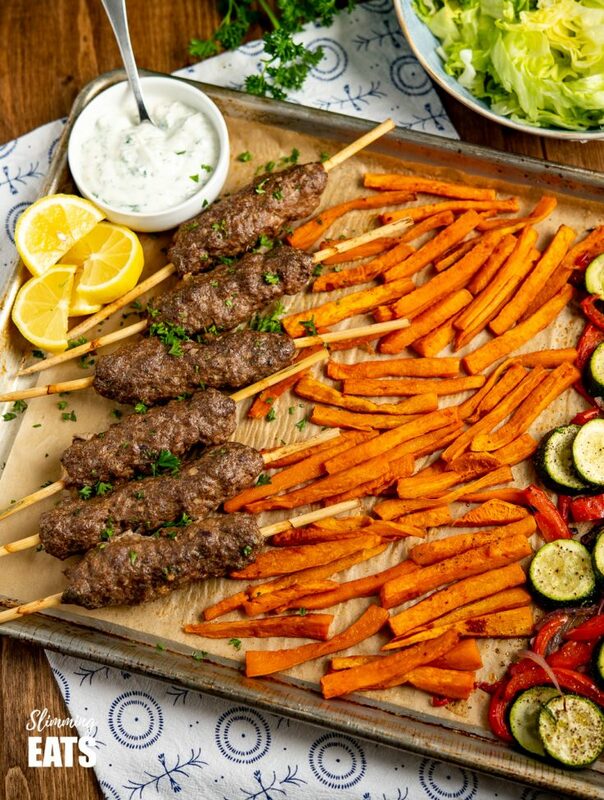 This Beef Kofta Tray Bake is perfect for busy weekdays, when I am rushing around trying to get things done and really don’t want a dozen pans in the sink to wash up. It is also equally simple for the weekend, when you are out all day, come home and want a tasty fuss-free meal on the table. So with some beef mince to use up, I really didn’t fancy the usual spaghetti bolognese, chilli or cottage pie type dishes. Raiding the fridge and pantry for some other ingredients to use, I grabbed a very large sweet potato, and a few different vegetables and looking at what was in front of me. I really fancied beef kofta inspired dish. Setting some wooden skewers to soak in a little warm water while I got everything else prepared (soaking the skewers, prevents them from burning in the oven). 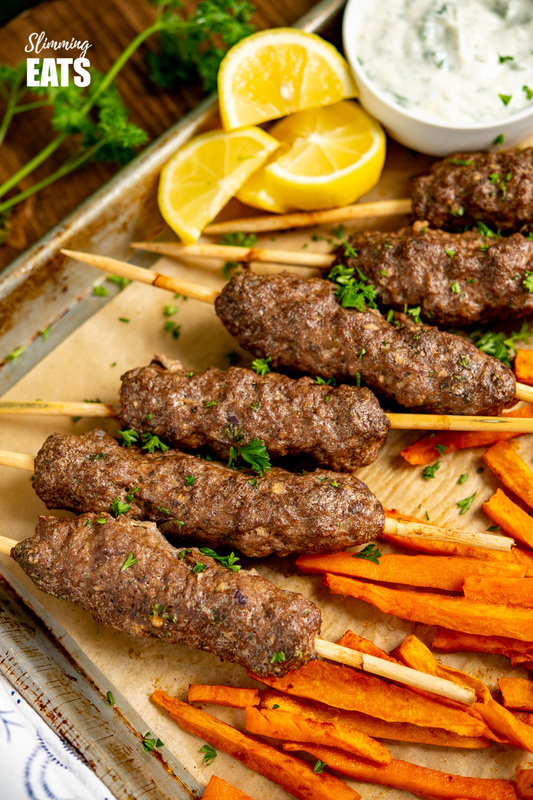 As different parts to this Beef Kofta Tray Bake cook at different timings, you can get the first part prepped first and then while that is in the oven, you can prep the next part. So first up was the sweet potato fries, peppers and onion. 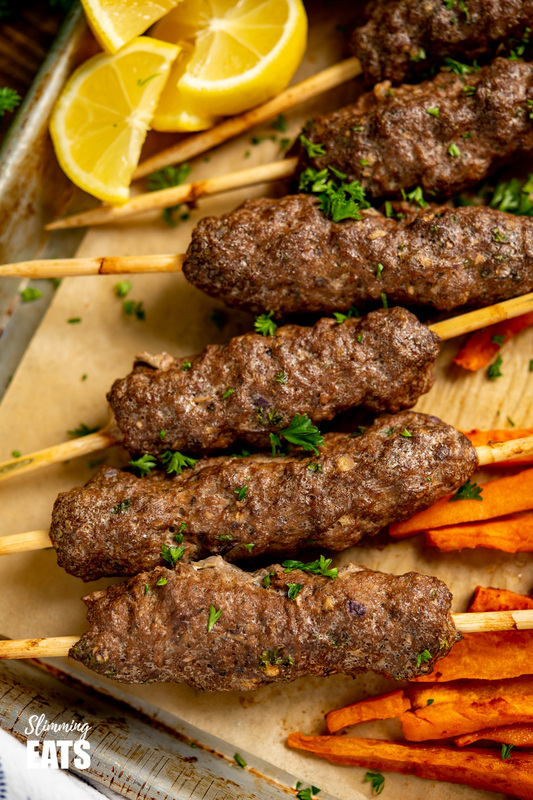 Get those seasoned and in the oven to start baking while you prep the kofta. 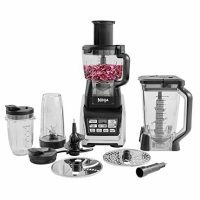 For the beef kofta, if you have a food processor I recommend using it to bind together all the ingredients. You can totally do it by hand, but I find they hold their shape together better when done using a food processor. Once the kofta goes on the tray with the zucchini for the final bake, you can prep the garlic yoghurt sauce and lemon slices. The kids had warmed wholemeal wraps (pitta bread would be great too), but as I didn’t have any healthy extra b choices spare, I settled on some salad to go with my serving. or head on over to my Full Recipe Index with over 850 delicious Slimming World and Weight Watchers recipes all fully searchable by meal type, ingredients, syn value and smart points etc. 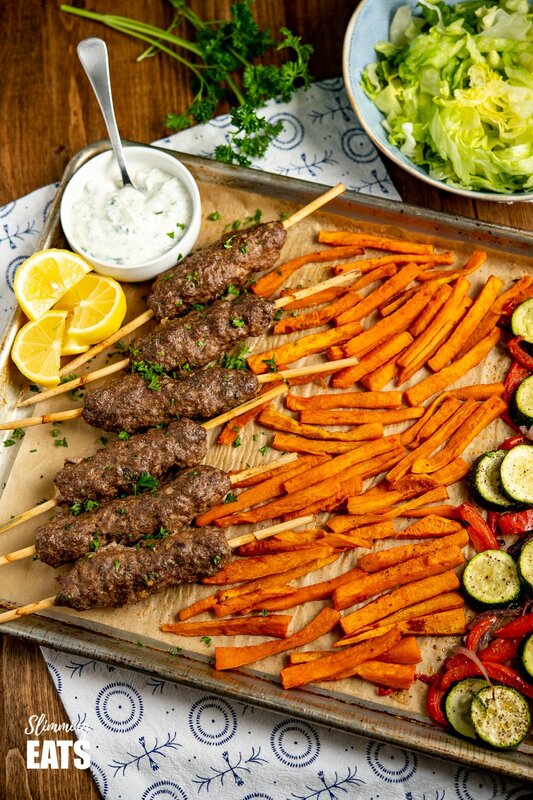 How can I add a 1/3 speed foods to this Beef Kofta Tray Bake? With the onions, peppers and zucchini, there are already lots of speed foods included in this recipe. Are you doing Slimming World Extra Easy SP day? You can swap the sweet potato for some butternut squash sticks instead to increase those speed foods even further. For my speed foods, I served alongside some crisp shredded lettuce. I love the combination of kofta, veggies, lettuce and that yummy garlic yoghurt sauce. Perfect!! Find me ON FACEBOOK | INSTAGRAM | PINTEREST | TWITTER | and YOUTUBE, come and follow me TO MAKE SURE YOU KEEP UP TO DATE ON ALL NEW RECIPES. You can also subscribe to Slimming Eats so that you never miss any new updates. 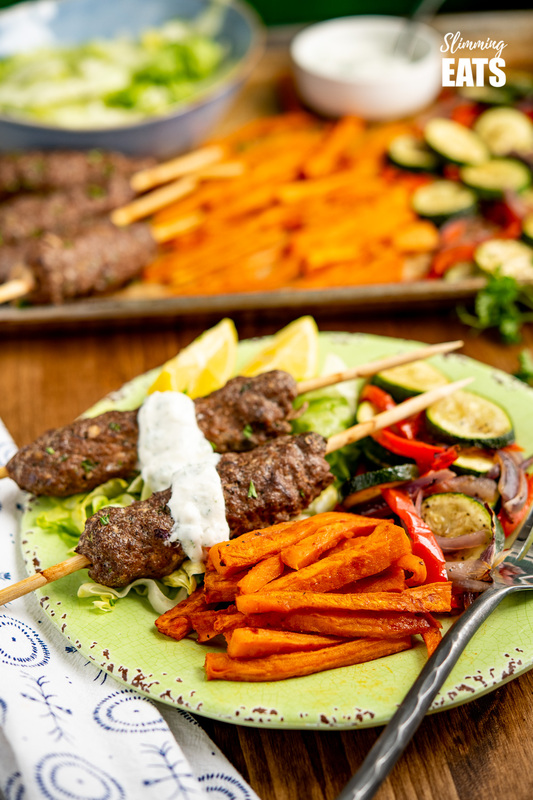 Yummy Beef Kofta Tray Bake - authentic Kofta kebabs with sweet potato fries and delicious roasted vegetables all finished off with a garlic yoghurt sauce. for an easy any day meal. add spices and egg and pulse a few more times until it all comes together. Add those to the middle well spaced out. Spray over the top with cooking oil spray and place in the oven for 20 mins. When the sweet potato, peppers and onion are almost done baking for 20 minutes. Add to the skewers and mold into 6 sausage shapes around the skewers. 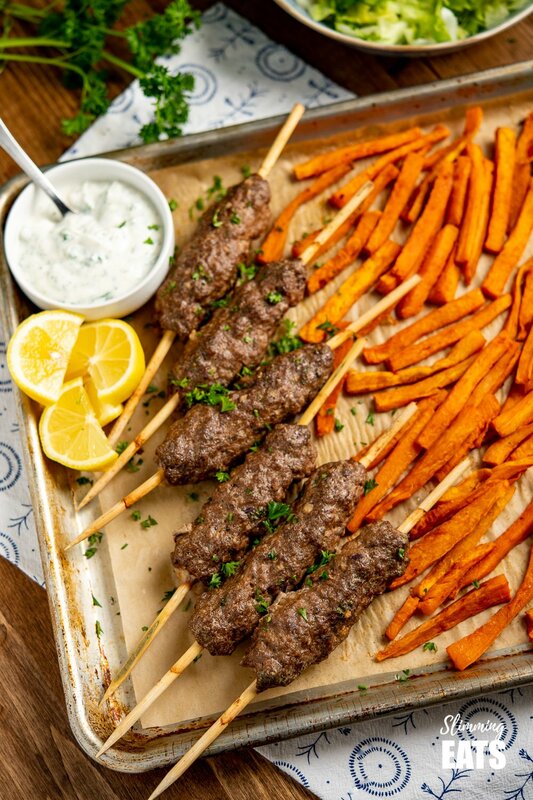 Remove tray from oven, add the kofta skewers to the clear 1/3 of the baking sheet. Top the onions and peppers with the zucchini slices, season over the top of the zucchini with black pepper. Place back in the oven for an additional 20 minutes, until kofta are cooked through. While that is cooking for the last 20 minutes, mix ingredients for the garlic yoghurt together in a bowl and season It with a pinch of salt and black pepper. 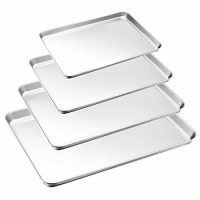 Serve the tray bake with the dip, lemon slices and shredded crisp lettuce. If you wish to share this recipe, then please do so by using the share buttons provided. Do not screenshot or post recipe or content in full.